The annoying part in question, lower right-hand corner. While we’re on the subject of golf-bag design, I’d like to raise the topic of legs. 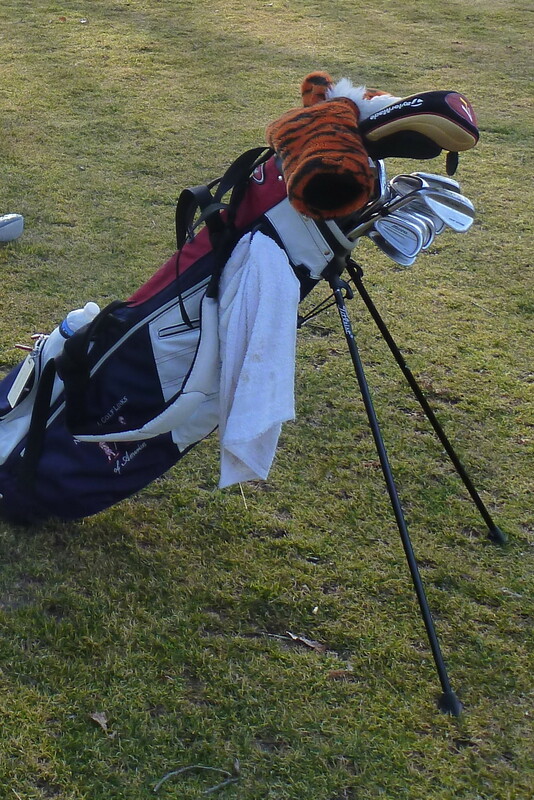 My first Sun Mountain bag (which had the Titleist name on it) worked great, and I liked it so much that I wore it out. My second, third, and fourth Sun Mountain bags, however, had a problem that it took me some time to diagnose. After a while, the bag stand on each would become noticeably harder to use, and eventually I found that I had to really slam the bag on the ground to get the legs to extend far enough to make it stand up. Titleist bag (made by Sun Mountain) with the same problematic leg joint. The problem, I finally realized, was that that the plastic joint connecting the leg to the bag had twisted, from the stress of repeated use, and no longer pushed the legs out as far or as easily as it had originally. That couldn’t happen with the original design, because on those bags the joint was super-sturdy—a solid hunk of plastic that couldn’t be torqued out of alignment. Bag with original, untwistable leg joint. I solved this problem for myself by performing a radical legectomy on my first Sun Mountain bag (which I still had in my garage because I never throw away golf stuff) and transplanting those legs onto my current Sun Mountain bag—which now works great. I mentioned this to Rick Reimers, the C.E.O. of Sun Mountain (whom we should all bow down to for his long record of fearless innovation), at the P.G.A. Golf Merchandise Show, in Orlando, back in January. He wrote down my gripe on an index card but said he’d never heard of it before. I know I’m not making this up, because other guys I play golf with have noticed it, too. Or maybe we just play insanely many rounds and therefore have difficulties that normal people don’t. Thoughts? 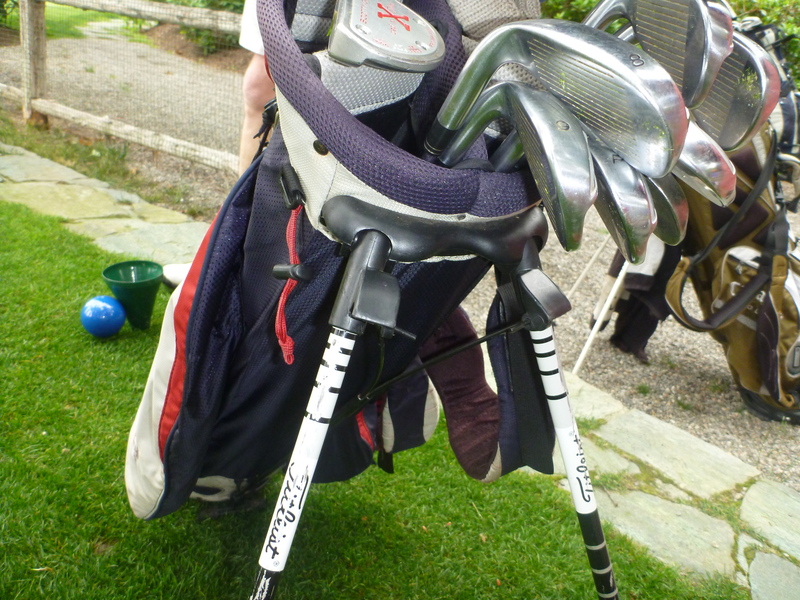 This entry was posted in Accessories and tagged golf bags, legs, stand bags, Sun Mountain, Titleist by David Owen. Bookmark the permalink. someone should get the patent on the jones bag, out of portland, or. they made a great stand bag. sun mtn is slipping, though. the cart bags they make about 5 years ago were the best, but they just couldn’t leave it be, and now the ones they make, just when i need a new one, are silly. I have exactly the same problem with an Oggio bag. I put it down, then I have to push the legs out, a little bit further from the bag, with my foot to make it stable. I can live with that. Hi David, I do not use a carry bag, (too old) but talking about bags I had an Adams bag, and although the bag itself was fine the two main zips on the large pockets on either side failed, rendering it useless. I am just like you, it is still in the garage. I have the same issue. I’m a walker and I just had to buy a new Sun Mountain because a leg wouldn’t open properly. My new bag is probably my 7th or 8th Sun Mountain. I love them, but they do break down. One of my zippers also separated from the bag. Also, my previous bag cost less than $100, the new one is $135. Your picture begs the question…. why did you shell out for a beautiful Scotty Cameron Red X putter – and then not put a putter cover on it? great article. Do both of the bags in the photo belong to you? I only ask because you must be the most talented golf writer on the planet because I’ve never seen anyone with both left and right handed clubs. David, I have the same problem with my Sun Mountain bag. I now have to kick the legs to get it to stand properly. Probably time for a new one as it’s beginning to wear out in some places. Otherwise a great carry bag. I have the exact same problem with my Ogio bag. I’m not sure I have the technical aptitude to perform a modification, either. I have the opposite problem on a beloved (5+ year old) Datrek bag, instead of warping the plastic retainer split and now the legs extend so far that the bag ends up standing about 12″ off the ground. 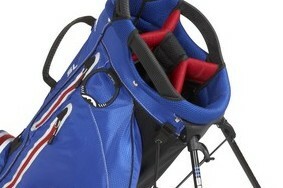 As far as I have seen, there is definitely room for improvement in this aspect of stand bags (metal?). I have a Titleist bag that is about 2 years old. I have the exact same problem with the legs. And for that matter the exact same problem with the pencil pocket as you described in a previous post – that one I solved by getting a shorty Sharpie marker. I haven’t been able to solve the leg issue. David-I had to retire a Sun Mountain bag for this very reason. The mechanism at the bottom was badly twisted. I loved the bag but I switched to a Ping bag because whatever thing gets the legs to deploy isn’t exposed outside the bag. Loved the look of the Sun Mountain bag though. Nickos, that’s my putter and I inherited it from my recently deceased brother in law. I do have a cover for it and protect it from any contact with any other club. I invite anyone to invest in a Scotty Cameron as it will surely improve your putting. By the way, the bag is about 10 years old and still trucking. I have had the same experience and have had to replace two bags in the past year! I really like the idea of using a Sharpie marker. I will have to give this a try. I think most golf-equipment manufacturers depend on the fact that most golfers don’t play very many round and, when they do play, usually ride in carts. Most carry bags don’t get carried, and as a result their flaws aren’t obvious to most of the people who own them. True of golf shoes, too.